If your business has exempt employees (employees who do not have to be paid overtime), then you should pay attention to new proposed rules issued last month by the Department of Labor (DOL). The proposed rules will raise the minimum salary level used to determine whether an employee is exempt from receiving overtime pay for working more than 40 hours in one work week. Currently, the salary threshold is $455 per week, or $23,660 per year. The proposed new DOL rules will raise the threshold to $679 per week, or $35,308 per year. Other changes to the rule allow employers to include “certain nondiscretionary bonuses and incentive payments (including commissions) to satisfy up to 10% of the new $679 per week salary threshold”. In addition, the salary threshold to qualify for the Highly Compensated Employees (who are subject to a less rigorous duties test) will increase from $100,000 to $147,414. What’s the bottom line? The DOL estimates that around 1.1 million people will start receiving overtime pay that currently are exempt. What should your business do? Immediately begin auditing your exempt employees who currently make between more than the old $23,660 per year, but less than the new limit. Anyone who earns more than $5,308 also needs to meet the duties test of working in specifically-defined executive, administrative, professional, computer and outside sales roles to qualify as exempt. These “duties tests” are not changing, but you really should audit all exempt employees to ensure that you are properly classifying them. If you have any “highly compensated” employees who earn between $100,000 to the new $147,414 who would not pass the duties test, they may need to be reclassified as well. Comments will be taken for 60 days by the DOL, with implementation of the new rules expected January 2020. Giving them a pay raise. Working out a schedule that doesn’t incur overtime hours. Keeping your employee’s hourly pay the same and budgeting for more overtime hours. 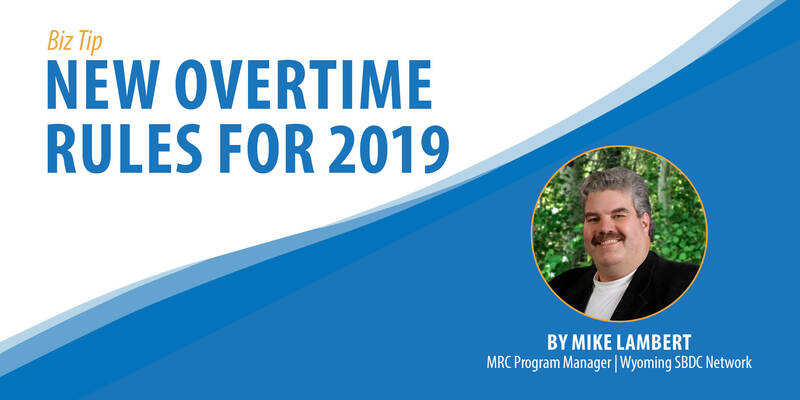 If your executive, administrative and professional employees become eligible for overtime, consider increasing their salaries to exceed the new threshold if they often work long hours. Do some homework — it may be less expensive than overtime costs. Should the salary level rise and make most of your team non-exempt, hire more employees to spread the work around and avoid having fewer employees put in overtime hours. How do you see these overtime rules affecting your business? If you have questions about these proposed rules, contact your local advisor by clicking here. About the Author: Mike Lambert is the manager and first employee of the Wyoming SBDC Network’s Market Research Center. In over 16 years Mike has built an information resource for Wyoming businesses that is unique in the nation. The MRC specializes in providing any Wyoming business with access to advanced marketing information that was previously available only to a few of the largest corporations. Mike’s individual expertise also includes marketing, product management, product development, international trade and export. When he’s not in the office, Mike enjoys spending time with his wife, daughters and grandkids, reading or woodworking.